Marathon number 18 was a windy one, but I'm not using that as an excuse. I've got plenty of others to draw from! Every marathon presents its own challenges. 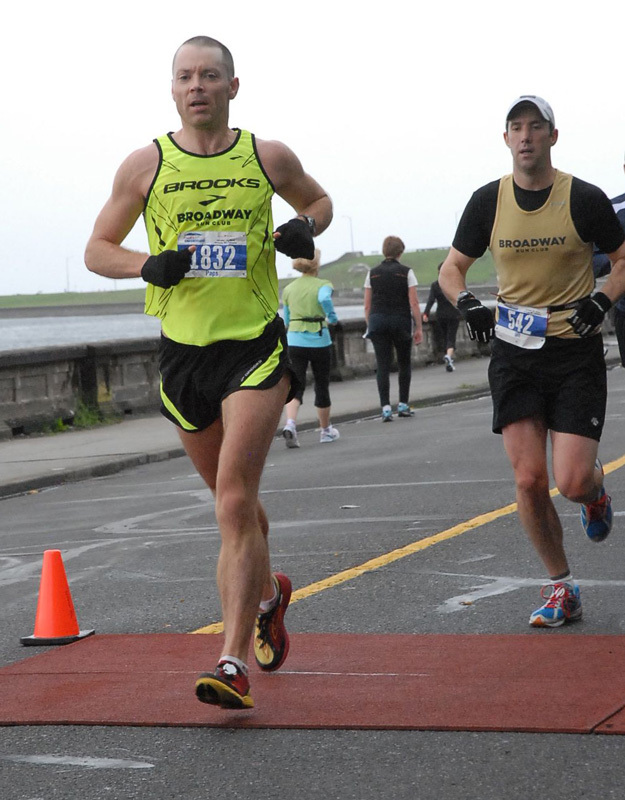 For everyone running the Goodlife Fitness Victoria Marathon this past weekend, the main challenge was the wind; for me personally it was also a mysterious lingering foot pain. This summer of training was tougher than usual for me, in large part because I was a little banged up and attempting to be an ultramarathoner through most of it. My list of aches included a lot of the usual suspects: a chronically sore hamstring, achilles tendinitis, a touch of plantar fasciitis, and of course the much celebrated osteoarthritic hip. I also added a new one to the list: a very sore, sometimes burning pain in the fifth metatarsal of both feet, which became so painful in my right foot that I thought it might be a stress fracture. I didn’t do anything to shorten this list of ailments by racing two 50-milers and a 50k as well as pacing Tim for 60k at the Fat Dog 100k 120k, so by the time I had run the Stormy 50-miler in August I was feeling tapped out, mentally and physically, and wondering if I could even get back on track to run Victoria. I was also leading my second marathon clinic this summer at the Broadway Running Room and while I admittedly pushed myself more than I should have through the injuries in order to run with the groups, the enthusiasm of the clinic members helped me through the rough patches when I was really questioning whether the wheels may have finally fallen off. Things came together in the final six weeks and aches notwithstanding, I was feeling really good about Victoria leading up to race day. 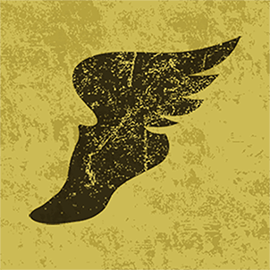 I’d had run some promising track workouts and felt like I had my road legs back, and the taper seemed to have taken care of all but my sore feet. By Saturday, the weather forecast had changed so it also looked like there would be no rain on race day. Sure enough, aside from the wind, the conditions in Victoria were ideal. It was cool to start, overcast for the first couple of hours and then warmed up as the sun came out for the remainder of the day. 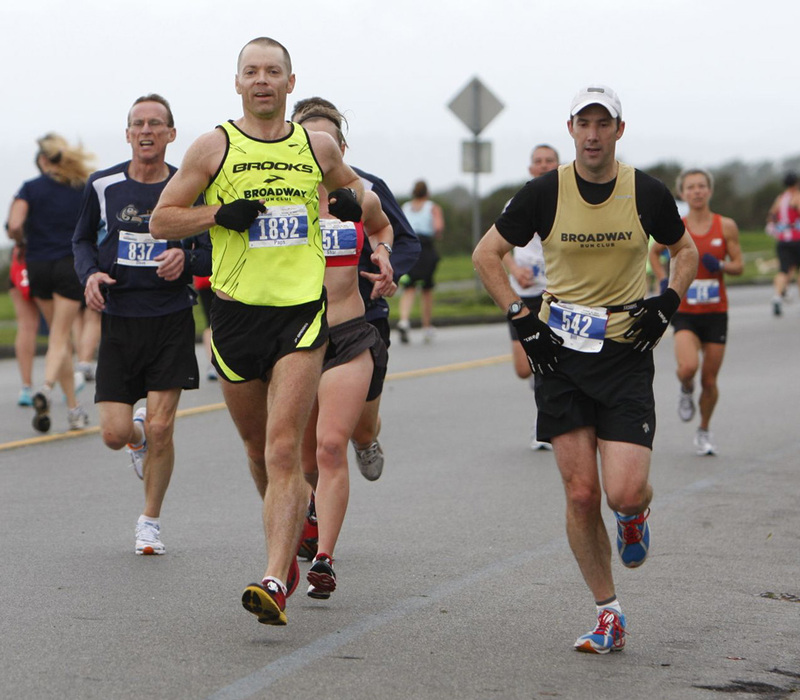 Unfortunately, the wind trumped all and with all the twists and turns, the amount of time the course spends at or near the shoreline, and the fact that the Victoria route is essentially one big out-and-back, runners were guaranteed to be hit by wind from every angle along the way. This was my third Victoria Marathon and with so many familiar faces running every year, Victoria always seems like something of a reunion. 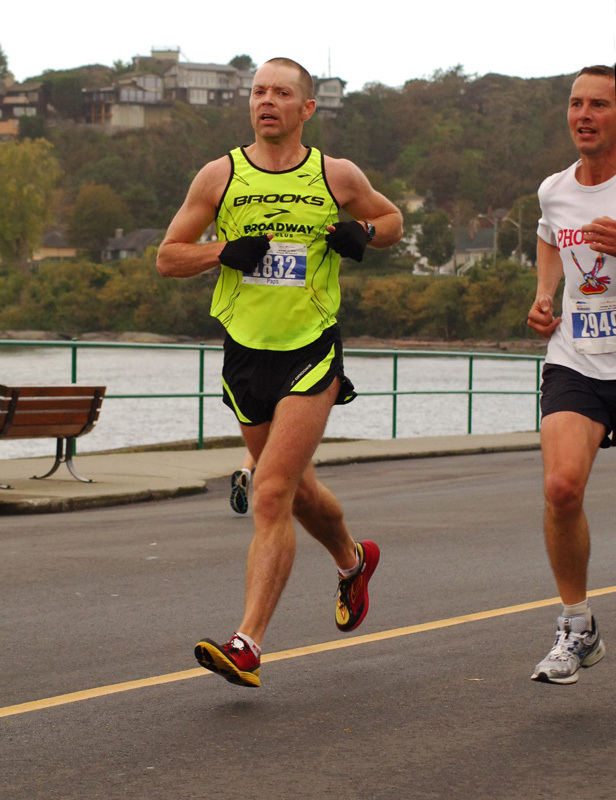 This year was even more special as I had the chance to pair up with my old partner in crime, Bill Corsan, who now lives in Nanaimo and would be running his first marathon since Vancouver in 2008 where he ran a 2:54 just days after the birth of his son. Bill was aiming to run somewhere between 2:50 and 3:00 but said he’d run with me for 10k and then do his own thing. So, while we watched our teammate Aaron disappear on 2:40 pace into the surprisingly massive line of runners ahead of us off the start, Bill and I settled in for a relaxed first 10k. Dario ran with us for a while before he got tired of hearing about the good old days and pulled away. We also spent some time with three-time Victoria Marathon women’s champ, Suzanne Evans, who always seems so darned delighted to see us at races. After Bill and I parted ways at the 10k mark, I quickly hitched a ride with a small pack which included Dario, Kristina Rody and her partner Ollie, and a few others. We were later joined by Henry Chan whose absence at the start had me a little worried. Henry has been chasing the 3:00 mark for years and a year ago ran a 3:00:55 on this course after nearly even first and second half splits. Henry has been running as well as I’ve ever seen him and I knew if he ran a smart race this year that he wouldn’t just break three hours, he’d smash it. Ummm… dude, we’re running sub-2:50 pace. It was an innocent enough question. The first time. But like a child on a long car ride asking “are we there yet?” it seemed like Henry would ask again every five minutes. Hey, whatever it takes to keep his head in the game and get him in under three hours, I figured. We were joined by ultramarathoner Matt Sessions around 15k and at times our little pack swelled to double digits as we wound our way through Oak Bay toward the Uplands. Somewhere on the way we lost Dario. He had a rough second half and I don’t know if it was the wind that wore him down or the crazy weekend doubles he’d been running the past month or so, doing long runs with the group on Sunday after long trail runs with Tim Wiens on Saturday. Or maybe he was just taking it easy in preparation for the Granville Island Turkey Trot 10k the next morning! Henry continued to ask about our pacing, but also started questioning why I wasn’t handing him bottles the way Ollie was for Kristina. 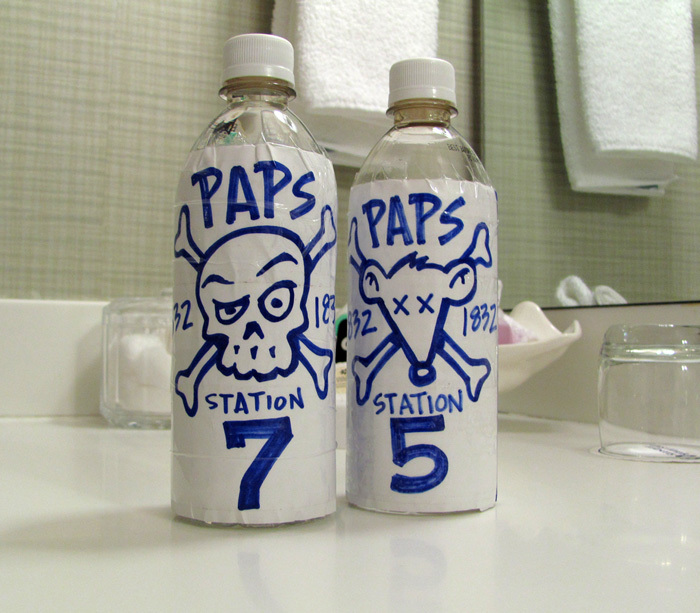 At each elite drink table, Ollie would surge ahead and grab Kristina’s bottle, unscrew the cap and hand it to her. The chivalry clearly made Henry jealous, especially when he saw me grab my bottles from the tables without even offering to share. Kristina even offered her bottle to Henry at one point, presumably to shut him up. Henry declined. Thank you Kristina, we all appreciated the effort. It should be noted that with all of its vegalicious goodness, VegaSport is an acquired taste, so after seeing a dangerously dehydrated Tim pass when I offered him my last mouthful of VegaSport at Fat Dog, I didn’t think Henry would go for my cocktail of Lemon Lime VegaSport, Gu Brew and CarboPro powder even if I had offered. Hands off my bottles! Yeah, I'm talkin' to you Gilbert Kiptoo! The run back from the turnaround at Victoria is uplifting, both because you have a sense of where everyone else is and because after miles of running away from it, you are finally heading toward the finish. I had the added bonus of passing the time playing Where’s Waldo, spotting marathon clinic members in the waves of people heading north. Seeing them always cheers me up. I finally lost contact with Henry at the turn onto Oliver just after 30k, content that he could practically walk in a sub-3 from there. Naturally his last words as he faded behind me were, “are we still on sub-3 pace?” Yes, Henry. We are. Alone at 20 miles, I started reeling in other runners. 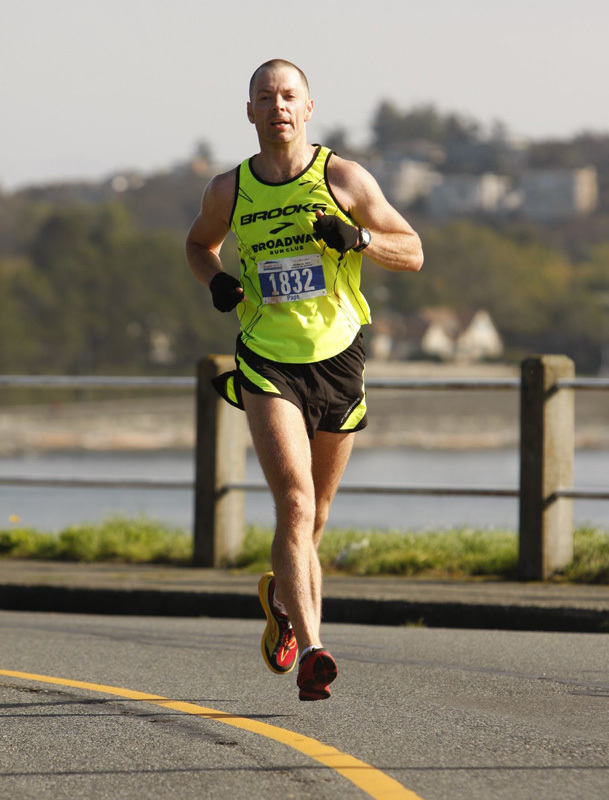 I waved to VFAC coach John Hill, beaming from watching the performance of his top three guys — Kevin O’Connor, Graeme Wilson, and Dave Palermo — from his usual spot just past the 20-mile mark at the left turn from Oak Bay Road onto Mitchell. Around the corner I passed a very uncomfortable-looking Chris Barth standing and talking to a course marshall. The race was clearly taking its toll. My right hip finally made a few noises around 33k. With my right foot and upper left hamstring screaming for attention, the stiffness in my hip barely registered, but it did check in to make sure it hadn’t been forgotten. I felt some minor twitches in the belly of my left hamstring late in the race, did some precautionary kicks to try to loosen it up and it wasn’t an issue the rest of the way. Oddly, my right achilles which was sore leading up to Victoria wasn’t sore at all after the race. Hey kids! You heard it here first: marathoning cures achilles tendinitis! I like the last 10k of a marathon because my internal calculator loves breaking down those single-digit distances and presenting the remaining mileage as easily manageable segments I’ve run hundreds of times before. 10k, 8k, 5k… runs of these distances are usually walks in the park, and just when I’m finished mulling over the different scenarios of one distance, I hit another kilometre marker and start the process again. I also had plenty of rabbits to chase over the last 10k or so. As much as I felt like I was slowing, it seemed like everyone else on course was slowing a whole lot more. 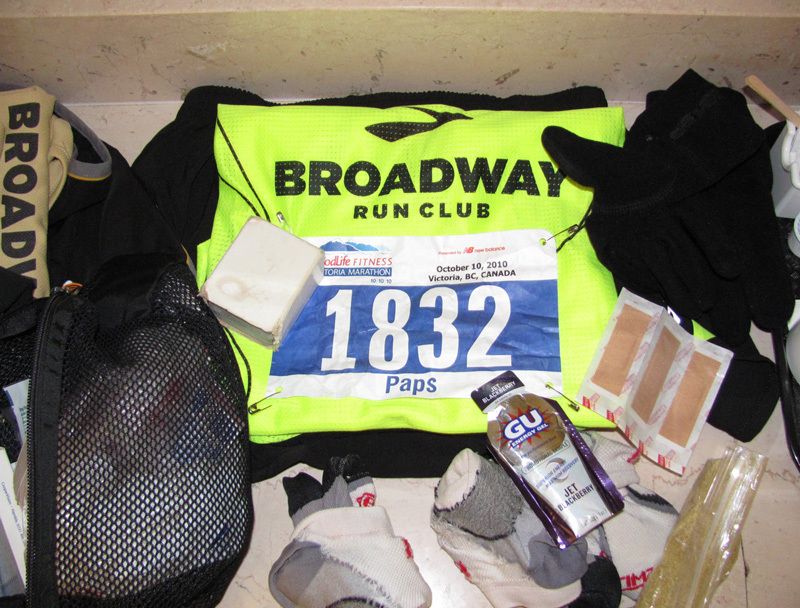 The numbers I crunched from the race splits back that up: I was in 66th place at 10k, 59th at the half, and 49th at 30k. That means I passed 21 guys in the last 12.2k of the race en route to finishing 28th overall. I was also the only runner in the top 30 to have a positive split of less than one minute, leading me to the logical conclusion that if Athens had been 20-30k further from Marathon, I might have caught Philip Samoei for the win! Yes, digging deep looking for the positives in a race — no matter how abstract — is one way I have to make myself feel better about not meeting my pre-race goals. I didn’t realize until late that I was slightly behind last year’s pace but by then, it didn’t matter. My back-up, back-up goal was to continue to bore Rich Widdifield by keeping the sub-2:50 streak alive and it looked like I would do that without much problem. 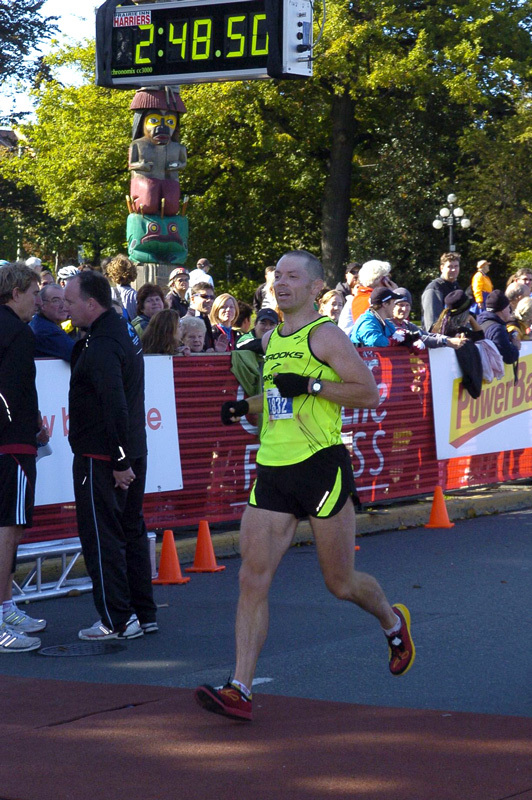 As usual, the crazy zig-zag final mile seemed to go on too long, but it wouldn’t be a Victoria Marathon without it. Incidentally, for future reference, staying at the Coast Hotel at the foot of Kingston, half a mile from the finish, helps break up the long eight-turn zig-zag into two, more manageable four-turn zig-zags. My chip time was 2:48:50, slightly behind last year’s 2:48:22 and nearly two minutes behind the 2:46:55 I ran in 2008. Aaron finished 18th in 2:42:58. Henry was 47th and as hoped, crushed the three-hour barrier with a 2:53:58 while Dario cruised in with a 2:59:28 to round out our team scoring and put us on the Open Team podium for the third consecutive year. Sadly, Bill pulled a hamstring and dropped out at 35k. I want to give a quick shout out to the Brooks Canada ID Program for the fancy new duds. No, the guy in the neon yellow Brooks singlet who crossed the line second overall was not me, but I hope I didn’t do too badly in their eyes. That was marathon number two for me in the Brooks Green Silence, which is pretty good considering a year ago I never imagined that this 185-pounder could ever run a marathon in racing flats. As mentioned, Dario hopped a ferry back to Vancouver and ran the Turkey Trot on Monday morning, finishing 11th overall in 38:25. Brian Wynhoven was 5th overall in 36:08. Congratulations guys! Great job, Dave! 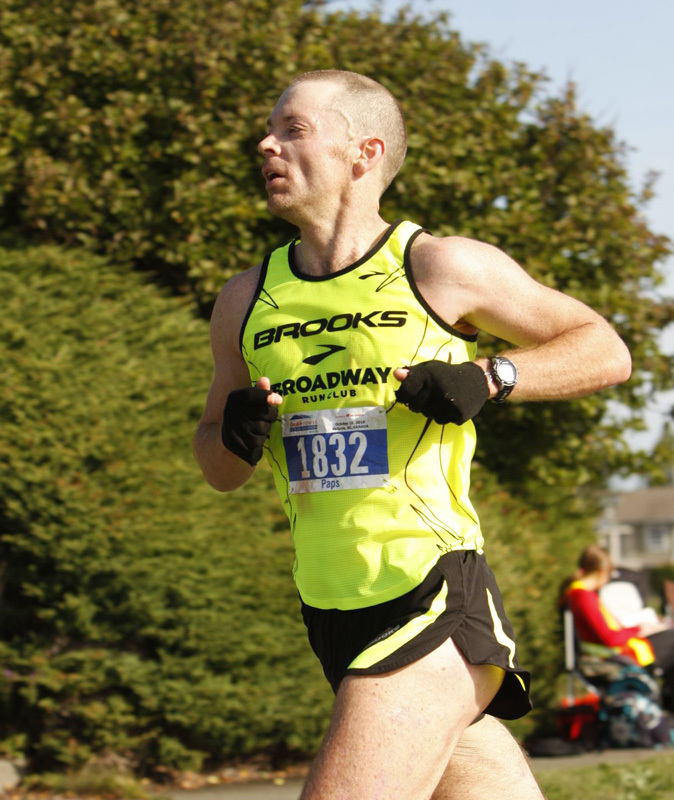 We at Brooks are proud of you and inspired by your phenomenal finish and also account of the journey to the end. Thanks for sharing and keep up the spirits! Amazing season! Great list of issues too 🙂 2:48? That’s an awesome time.